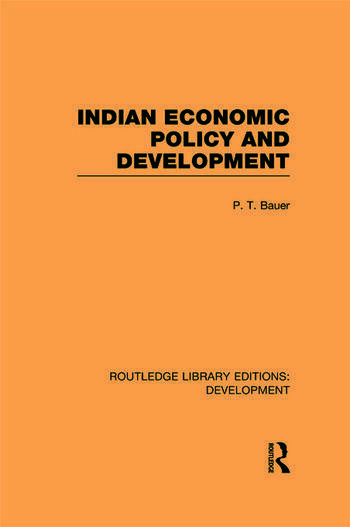 Professor Bauer’s book, first published in 1961, reviews the major elements of contemporary official Indian development policy, considers their economic implications and their probable political and economic results. He then examines alternative approaches to the promotion of development. The development plans, notably the Second Five Year Plan and the official outlines of the Third Plan, receive major attention, but the author also considers other official policies and measures affecting economic development, which do not usually figure prominently in the formal development plans. Specific themes which Professor Bauer considers are: the influence of social customs and attitudes on economic progress; the relationship between investment expenditure and economic development; inter-relationships between agriculture and industry; the heavy industry programme; the controls over the private section; the relation of Plan finance to the foreign exchange crisis; the role of foreign aid; and the importance of certain major political objectives.